Make no mistake. It was soul man Little Milton Campbell who broke the ice inside of that silver Nissan Altima as it sped north out of Houston on a hot September night 10 years ago. Quite a feat, really, since Little Milton had been dead for almost a month. But with just one question from the old guy in the back seat of my car, our 600-mile drive got a lot easier. My longtime buddy Billy Dawson, who was riding shotgun, let out a laugh. And so began my friendship with James Williams, the Little Milton fan stretched out across my back seat. Billy and I had met James inside the Houston Astrodome just a few hours earlier. He was 61 years old and built like an NFL tight end from another era. Shortly after the three of us met, James walked silently out of the arena with Billy and me, clutching only a small plastic grocery bag that contained some medicine and personal effects. I still don’t know what he was thinking as he got into the car with two absolute strangers — a pair of 40-something Chicagoans, one black and one white — who had promised to drive him to Memphis, where his 95-year-old mother lived, but I’m sure he quickly sized us up and decided we were a safe bet. 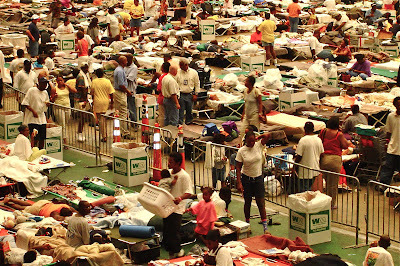 A couple days earlier, James, along with one of his favorite New Orleans neighbors, boarded a crowded bus outside the Superdome, only to wind up in Houston, along with thousands of other Hurricane Katrina evacuees. Around that same time, I had called Billy and told him I was losing my mind watching cable news coverage of the Crescent City flood. I had decided to drive to Houston to help with ongoing relief efforts. I told Billy I was going to leave that evening, and I invited him to join me. Two hours later, I picked him up at his Kenwood apartment and we began our 1100-mile drive to the building once dubbed the Eighth Wonder of the World. We had no return date, no place to stay, and no guarantee that we’d even be allowed into the Astrodome, but we were fast talkers and those were minor details. I knew things were going our way when, after 12 hours of exceeding every applicable speed limit, a small-town cop in Texas let us off with a warning after I told him we’d been driving through the night from Chicago to get to the Astrodome. When we finally arrived at the arena, a Houston cop initially denied us entry into the stadium parking lot. I did my best to channel John Belushi’s off-the-cuff story from The Blues Brothers, where he quickly flashed an ID and claimed to be Jacob Stein from the American Federation of Musicians. I pulled out an Illinois attorney ID, popped my trunk to show the officer some relief supplies we’d brought from Illinois, and I quickly mentioned the names of one or two Houston lawyers I knew. And just like that, we were in. 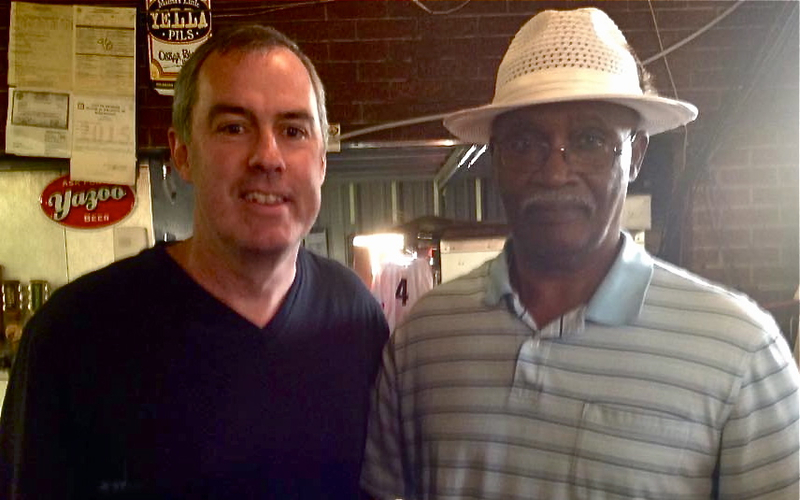 But neither one of us was prepared for what we were about to see — thousands of people, mostly black, occupying cots and stadium seats in the building where Billy “White Shoes” Johnson once returned kickoffs for the Oilers. 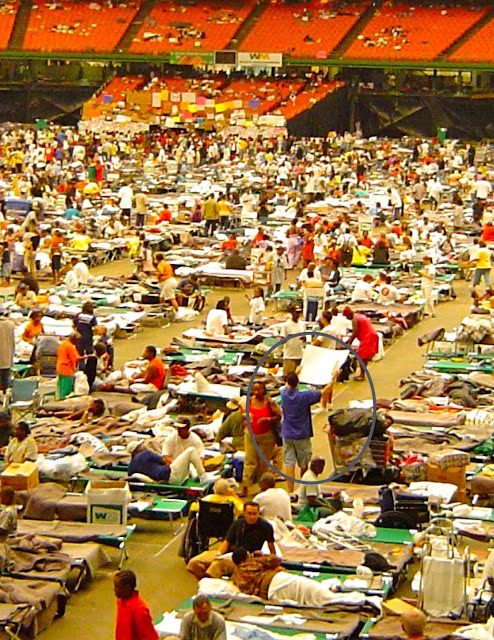 The one-time Eighth Wonder of the World had become, for all practical purposes, an American refugee camp. Billy and I quickly went to work wherever we could lend a hand. I’ll never forget meeting an anxious New Orleans grandmother who was by herself and having no luck locating any of her family members. She was distraught but still made it a point to give me a big hug and thank me for driving down from Chicago. She told me that my effort meant a lot to her. She had no idea where her family had ended up, but she found time to thank me. Go figure. 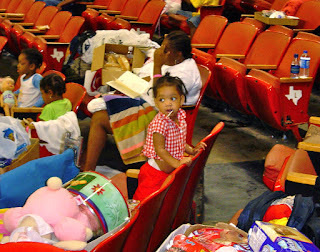 I experienced that type of kindness over and over again inside the Astrodome. At some point in the evening, Billy and I had to come up with a lodging plan. We’d been doing some work alongside a nurse volunteer from the city’s M.D. Anderson Cancer Center. She’d recently moved to Houston from Jamaica. She was trying to make heads-or-tails of our story. Two middle-age guys from Chicago drove through the night to Houston with no real plan and no place to sleep? She made a joke about us possibly being ax murderers before inviting us to stay at her house. To this day, I’m convinced Billy’s dreadlocks helped get that deal done. 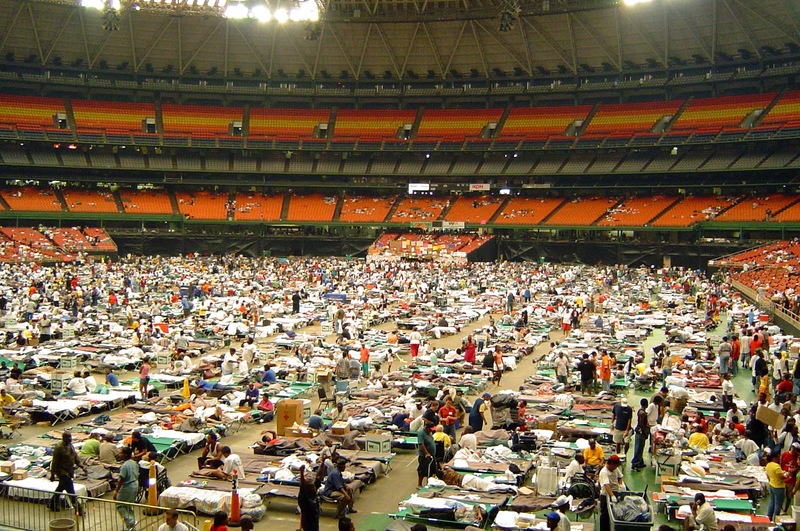 It was an unsettling feeling leaving the Astrodome to sleep in a stranger’s comfortable home in Houston, knowing that thousands of people were going to be on cots for many nights to come, but it was also another act of kindness that I appreciated. 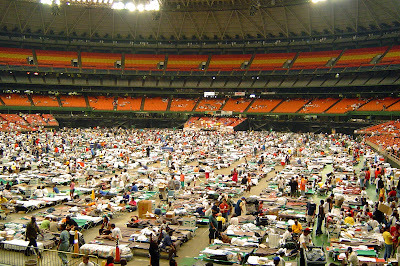 The next day, more evacuees arrived at the Astrodome, and Billy and I did what we could to help them. Later that afternoon I decided that we should offer to drive some evacuees to Memphis, St. Louis or Chicago — three cities we would hit on our way home. I bought some poster board and markers and made a sign indicating that we could drive up to three people to one of those destinations. I then spent an hour walking the floor of the Astrodome holding that sign above my head. A young woman stopped me to ask about my offer. She told me she was there with one of her New Orleans neighbors and said that her neighbor’s mother lived in Memphis. She asked if she could have a few minutes to see whether that neighbor, James Williams, might be interested in making the drive with us. James signed on, but Billy and I found no other takers, so early that evening the three of us walked out of the Astrodome and hit the highway. With Houston in my rearview mirror, I made two quick stops. We needed dinner and James needed some threads. There was no way I was going to deliver Mr. Williams to his 95 year-old mother unless he had at least a week’s worth of clothes. Retail options were limited on Saturday night, but I did manage to find a Walmart that was still open. Billy and I pushed shopping carts through that store like we were contestants on a game show spree. Quickly asking James for his shoe size, belt size, shirt size and favorite colors, we loaded up carts that would allow him to get around Memphis for a bit without having to worry about his wardrobe. Lord knows he had plenty of other things to worry about. During our meal and our shopping blitz, James was polite to a fault, but he didn’t have a whole lot to say — until I popped a Little Milton CD into my car stereo. That’s when the conversation got going. At that point, we became three music lovers making a 10-hour road trip to Memphis. I’ve stayed in touch with James since we met at the Astrodome. I’ve visited him in Memphis, and he’s stayed with my family and me in Chicago. He’s now 71 years old, and his mom just celebrated her 105th birthday. He’s been back to New Orleans three times since the flood (for a wedding, a funeral and a family reunion), but he’s told me he’ll never live there again. His old neighborhood is one that’s been left in disrepair. If all goes according to plan, James and I will again spend some time together next week. I’ve been promising my 13-year-old daughter a trip to Sun Studio and the Stax Museum of American Soul Music, and there’s no time like the present. On August 30, 2015, my youngest daughter (not pictured) and I had dinner with James in Memphis. We had a ball -- along with some great banana pudding and peanut butter pie for dessert.